Crossett, Inc. recognized five drivers and shop staff for continuing a 91-year tradition of excellence in service and safety. Drivers Brad Straight, Dennis Kemper, and Brian Ecelberger are all inductees of the prestigious Crossett, Inc. Million Mile Club, having driven one million miles incident-free. Additionally, mechanic Ed Zdarko is being recognized for 20 years of work incident-free, and welder Rick Woodcock is being recognized for 30 years of work incident-free. These outstanding individuals received their awards and enjoyed lunch with their proud managers. Clockwise, from upper left, are Logan Vivian, (Director of Operations), Ed Zdarko (Mechanic), Alex “AK” Keddie (Vice President), Brad Straight (Driver), Rick Woodcock (Welder), Dan Marsh (PA Terminal Operations Manager), Alex Keddie (Owner/CEO), Dennis Kemper (Driver), and Brian Ecelberger (Driver). 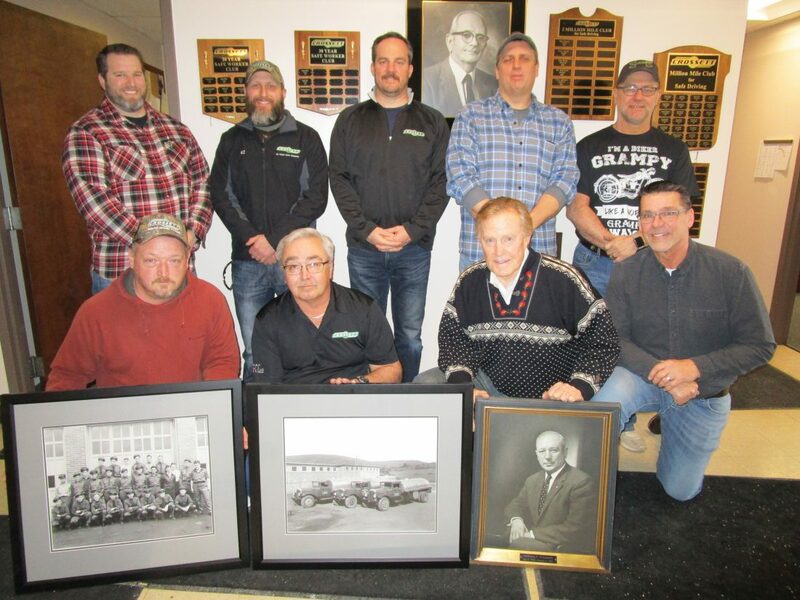 Awardees and management are pictured posing with historical photos of Crossett, Inc. drivers and trucks of the past, and a portrait of company founder William Crossett, whose proud tradition they continue.